Racine Restaurant is located on the beautiful Chamonix Wine Estate outside the valley of Franschhoek. At Racine Restaurant you can enjoy a delicious meal accompanied by a glass of Chamonix wine, whilst overlooking the private picturesque surroundings of the restaurant situated right on the foothills of the Franschhoek Mountains. Aptly named after the French word for Root, Reuben Riffel returns to Chamonix where he started his culinary career to create simple sophisticated bistro style cuisine of international standards. 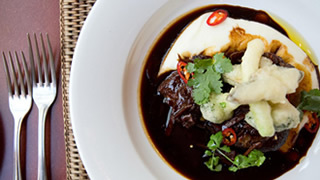 The Miso Braised Beef Cheek is fast becoming a signature dish of Racine Restaurant in Franschhoek. For those who prefer less complicated meals you can be rest assured to know that each and every one of the 17 dishes on the Racine menu permeates with natural flavours and melt in your mouth texture. In addition to exquisite gastronomy you can take advantage of the fantastic deli-section in which you can purchase a wide range of quality condiments and preserves.